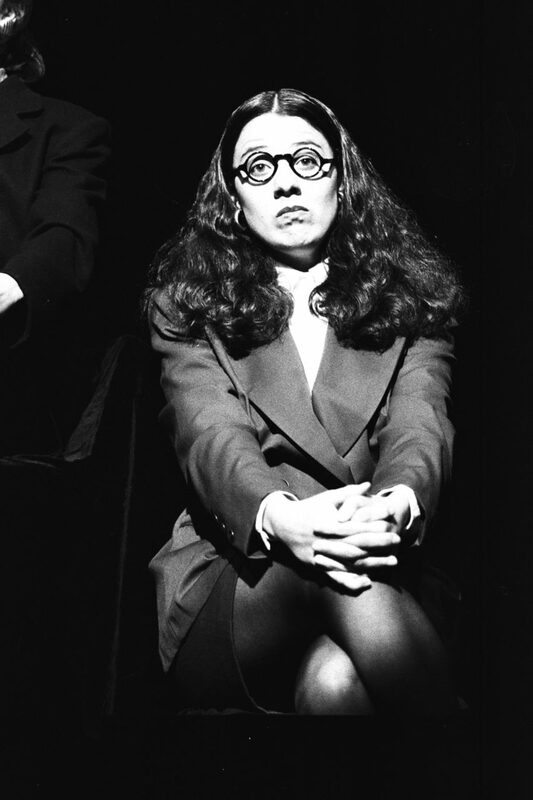 T de Teatre made their debut with the show Little tales of misogyny. 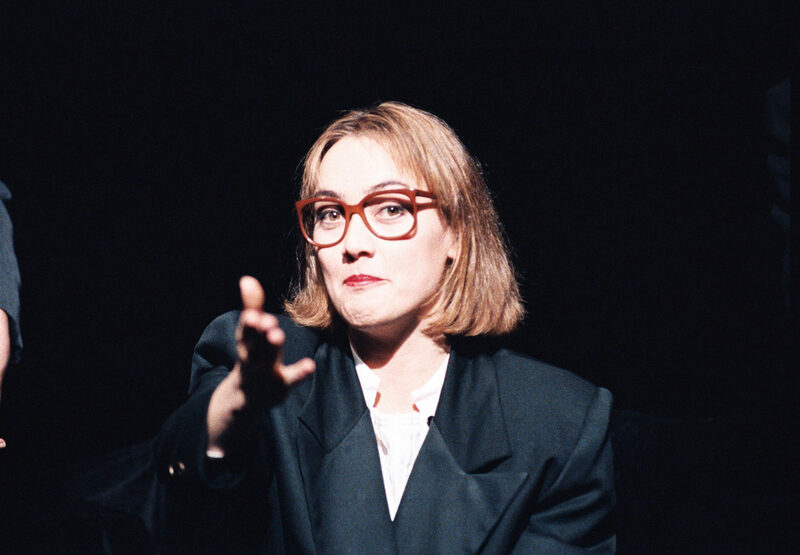 In May 1991, five actresses and a director, recent graduates from the Institut del Teatre in Barcelona, got together with idea of producing their own material. The first step was the choice of stories, because owing to the limited production time available they could only select six of the sixteen stories in the book by the North American author. They then defined the guidelines. 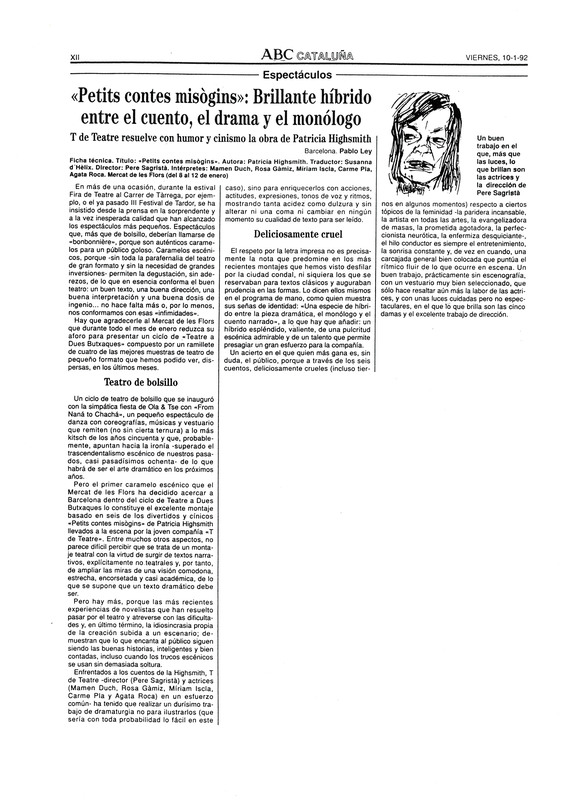 They wanted to respect Highsmith’s standpoint and avoid betraying the formal spirit of her writing, by maintaining the irony, sarcasm, mordacity and causticity of the six tales they chose: “The Breeder”, “The Artist”, “The Evangelist”, “The Hand”, “The Perfectionist”, and “The Invalid, or, the Bedridden”. They decided to remain faithful to the original narrative and opted for simplicity in the staging. After trying out and rejecting an endless range of possibilities for each story, they came up with the existing structure of their first show. 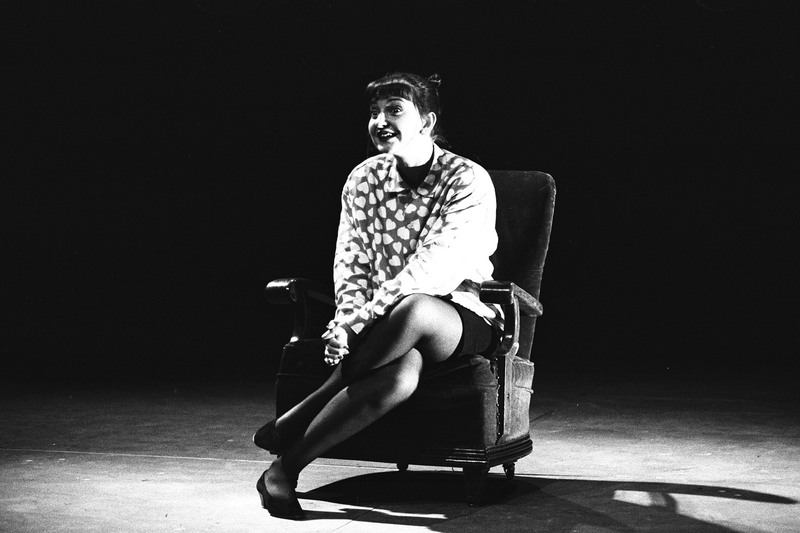 Little Tales of Misogyny is a hybrid production with three facets; a mixture of a play, a monologue and a spoken story. 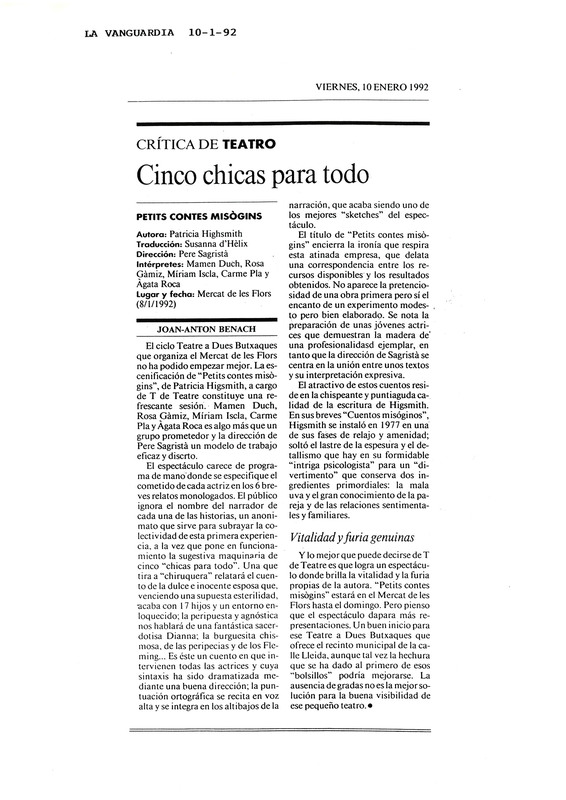 These tales were written by a woman, they talk about women and they are performed by five actresses: Mamen Duch, Rosa Gàmiz, Míriam Iscla, Carme Pla y Àgata Roca. 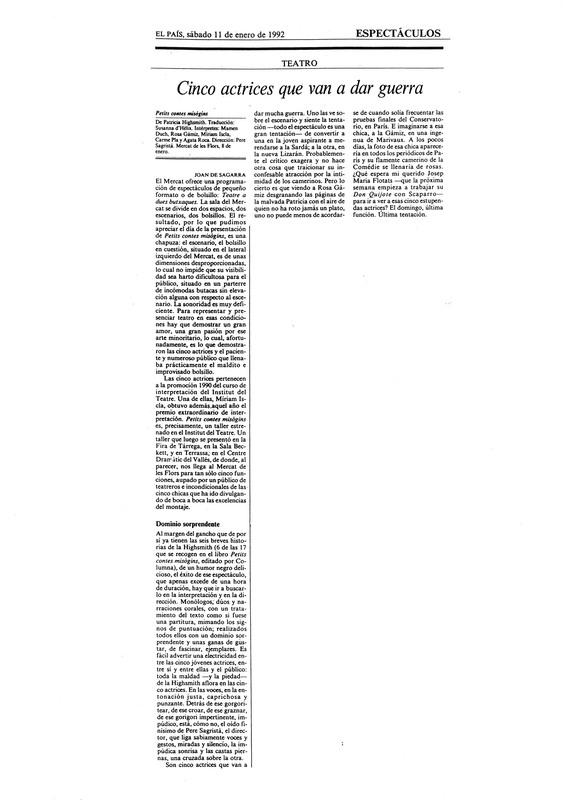 The direction was the work of a man: Pere Sagristà. They appear alone before the public, only aided by their bodies and their voices. And so the actresses themselves and the text are the show. But it’s misleading. Nothing is what it seems: their intention is to walk the thin line between reality and fiction. The actresses are not trying to be themselves, but they never play a stereotypical character either. And the fourth wall? Does it exist? Everything suggests it does, but… do they, in fact, break through it? And above all they wanted to play with the structure. In the penultimate tale —“The Perfectionist”— they develop the premise of loyalty from the original narrative to extremes. 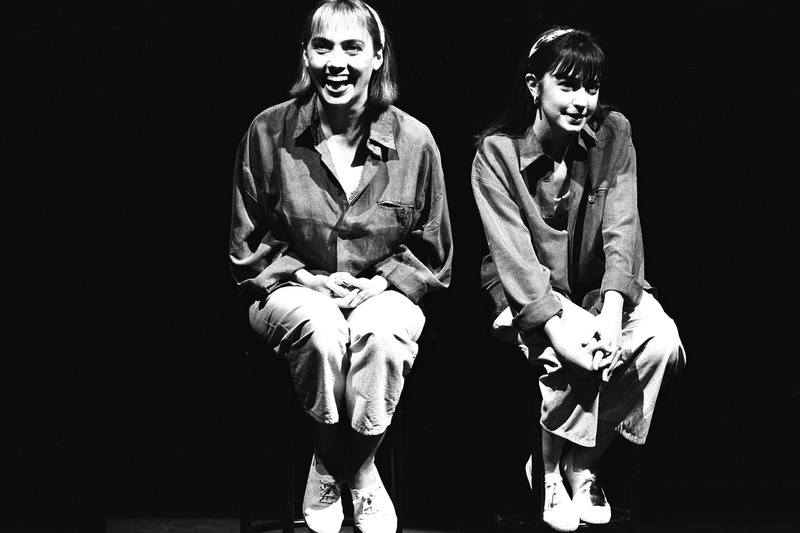 The actresses act out Highsmith’s tale with all its full stops and commas. They use each punctuation mark to express a multitude of connotations, right up to the last full stop. 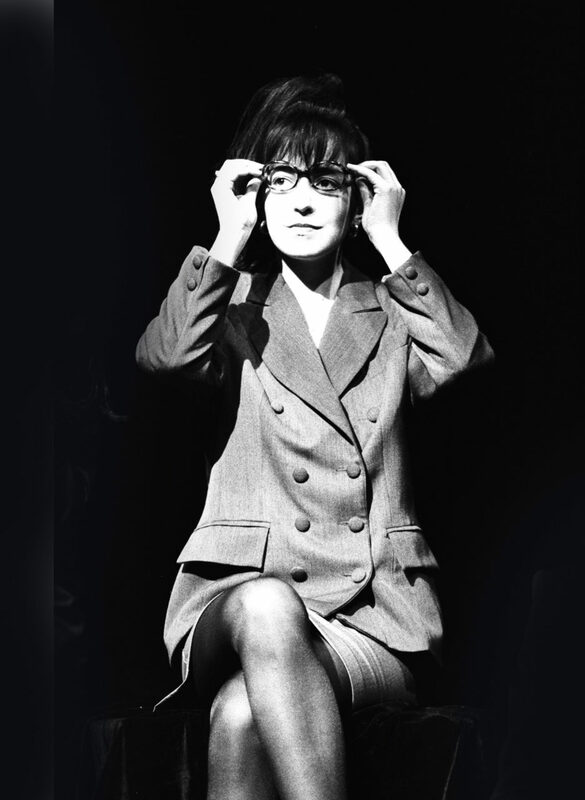 This original way of telling the tale makes “The Perfectionist” the icing on the cake in Little tales of misogyny, and generates a general feeling of looking forward to a new chapter from the T de Teatre company. 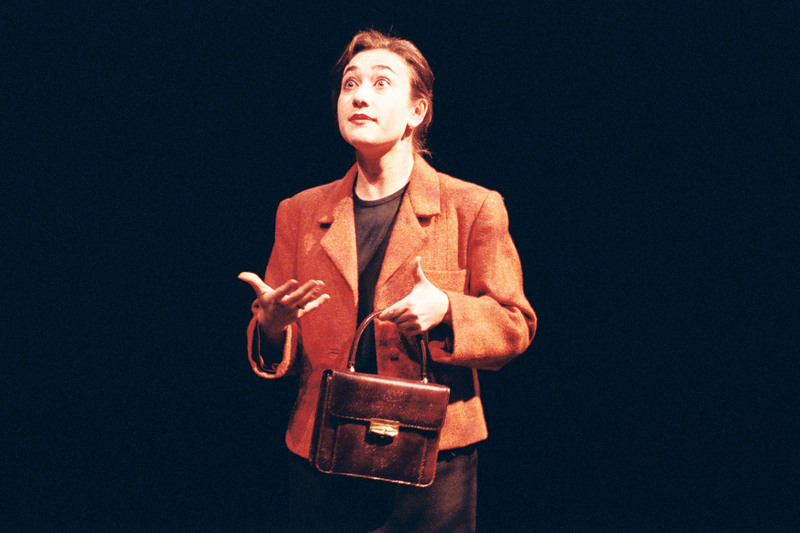 Little Tales of Misogyny was first staged at the Teatre La Cuina and the Sala Beckett in Barcelona. It was later performed at the Sala Maria Plans in Terrassa. It was the most popular, small-scale production at the eleventh Fira de Tàrrega. It returned to Barcelona and ran twice at the Mercat de les Flors, and at the Villarroel Teatre. The tour involved a large number of performances all over Catalonia and part of Spain. And to round things off, there was a performance in Paris. In total, it has been performed over 250 times and the reception from critics and public has been excellent. The company received the Barcelona Critics’ Award for the Theatrical Revelation of the Season for this show. 278 performances and 58,000 spectators. Actresses: Mamen Duch, Rosa Gàmiz, Miriam Iscla, Àgata Roca and Carme Pla. 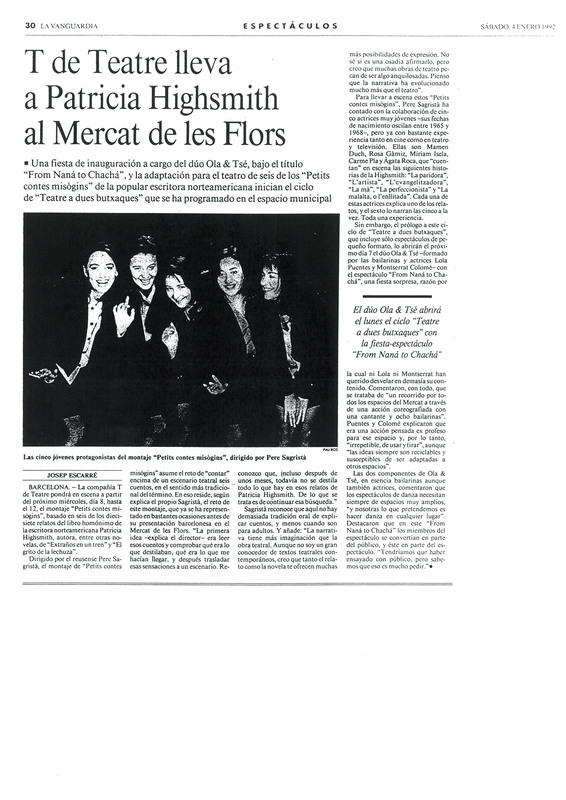 Co-produced by T de Teatre and El Mercat de les Flors de Barcelona. 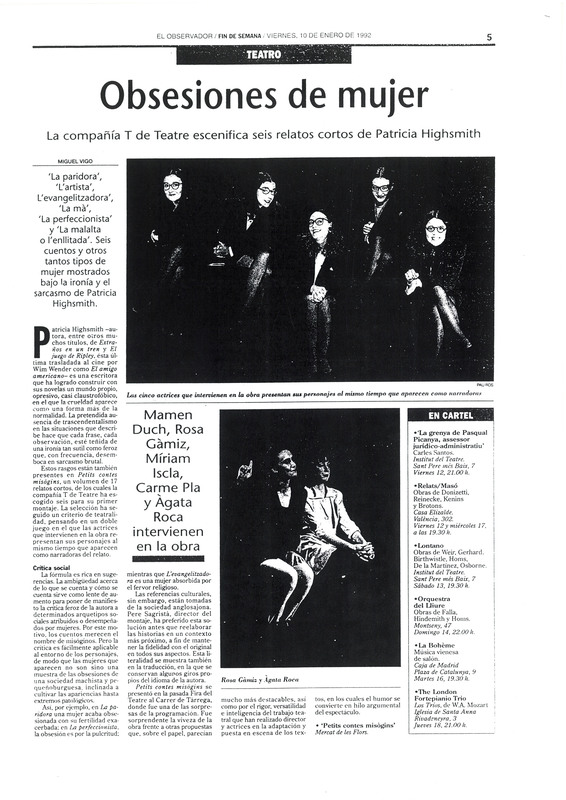 Show premiered at La Cuina – Teatre de l’Institut de Barcelona, May 6st 1991.